I recently conquered my fear of making shami kabab at home and made a huge batch for my freezer! Not only was it easy to make (a little time consuming but considering the amount you end up with not a big deal), but this means bun kababs all day everyday. This classic street food found in many cities across Pakistan is loved by all. A greasy soft bun is topped with a lentil and beef patti, doused in ketchup and chutney and topped with an omelette and charred veggies, squished down so nothing falls out and devoured in less than a minute flat. I could probably eat one while you read that extremely long sentence. 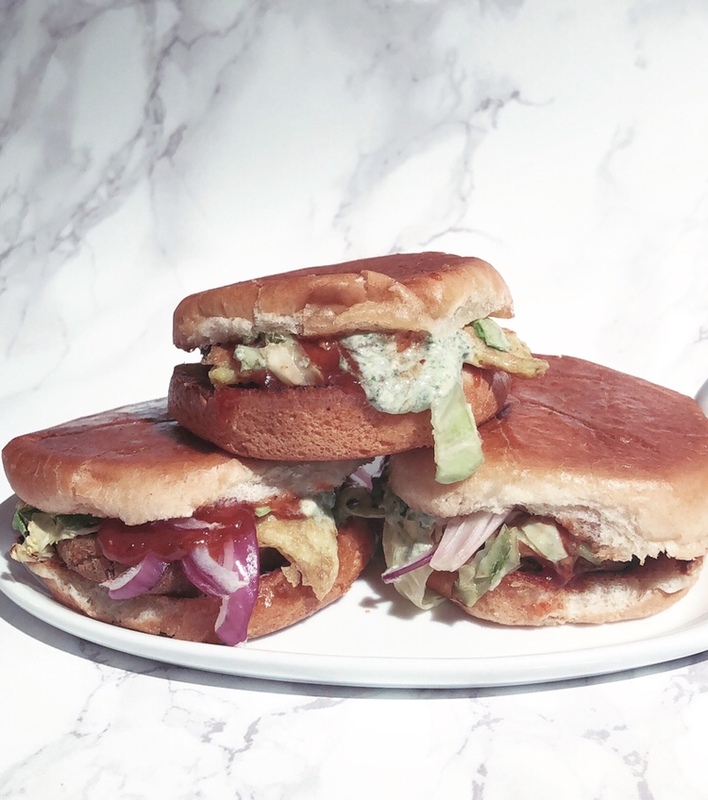 If you want the recipe for shami kabab just head over to my instagram and scroll through the highlights (fatimarana_) but here’s what you’ll need for 6 sliders. You can of course make these regular sized as well, but I have a thing for tiny food, so sliders. Sliders also are great to serve at parties. Traditionally a tawa is used. I have a cast iron skillet so I used that. Heat some oil in the skillet and toast the slider buns. Take out the tops and flip the bottoms over and reduce the heat to low. Add a shami kabab to each bun. Also place the onions and cabbage in the skillet to char a little. Beat the eggs and add the chaat masala and a pinch of salt. In a separate pan cook the omelette and cut it into 6 pieces and place one on each kabab. Traditionally everything is prepared at the same time on one huge tawa but since I only have a normal sized skillet I made the omelette separately. Once the cabbage and onions have begun to char add them on top of the omelette and spoon over the mint chutney and the imlee ketchup. Be generous with the imlee ketchup, it’s divine! Then sprinkle over some chaat masala, place the tops over the chutneys and flip the sliders over. Make sure there is enough oil in the skillet, if not add some more, because a greasy bun is an essential component to the ever delicious bun kabab experience. Press the sliders down lightly to squish everything together. There you have it. It’s not so difficult, especially if you have a huge box of shami kababs in your freezer!